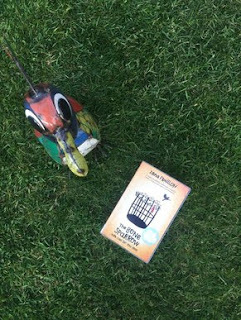 Traditionally, literary teen detectives find their earliest genesis close to home, cracking open the mysteries of family and friends before embarking on those in the wider world. These stories are often relatable on a level that far flung adventures and dystopian dramas struggle to achieve. After all, while we all might love the idea of saving the world, ferreting out the lies that lurk around our own kitchen tables is something far more achievable. 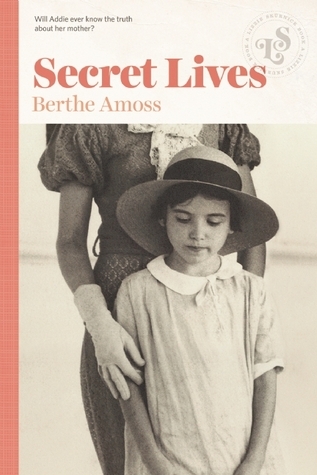 The titles Secret Lives by Berthe Amoss and Girl in Reverse by Barbara Stuber center on questions surrounding the life and loss of parents, especially mothers. In these historical novels, the protagonists suffer from feelings of abandonment and when tantalizing clues about their mothers are discovered they each embark on the hunt for more information. By placing their characters far from the era of computers and cellphones, the authors allow their narratives to unfold slowly and carefully. With their climbs into attics and visits to cemeteries, Secret Lives and Girl in Reverse mimic the classic girl detective plots but there are no Scooby Gang moments of catching a nefarious villain. These books are all about finding answers to very personal questions and the delicate balance the protagonists must consider as they pursue their own pasts. Girl in Reverse is the story of Lily Firestone, who was left at an orphanage by her mother when she was just a toddler. Now sixteen, she is the Asian daughter of adoptive Caucasian parents in 1951 Kansas. With the country immersed in the Korean War, Lily is frequently subjected to the cruelties of racism by her classmates and though dearly loved by her family, she is terribly unhappy. Everything changes when her younger brother Ralph finds a small box in the attic that came with her from the orphanage and includes a collection of Asian artifacts. Looking for information about the objects, Lily visits the local museum with its Asian exhibit, meets some of the archaeologists involved and eventually discovers what her birth mother had to hide and why. Surprisingly, Lily finds herself confronting someone she never expected and learns things that challenge her entire identity. The Firestone family is unaware of Lily’s past and more importantly, have a great deal invested in leaving it alone. Her adoptive parents are living their post-war 1950s ideal of peace and prosperity and are steadfastly determined not to acknowledge any conflicts that Lily’s ethnicity might cause. They care deeply for their daughter, but Stuber does a fine job of showing how their love is not enough to change what people think about her and denying her difficulties serves only to exaggerate them. Lily is suffering and her family history is what she needs to uncover so she can feel secure. In her case, the questions are beyond her parents’ comprehension and thus all of her detective work must be conducted in secret, albeit with the delightful assistance of her brother, who grasps what their parents can not. In Secret Lives, an out-of-print rerelease in the Lizzie Skurnick Books series, twelve-year-old Addie lives with her older unmarried aunts in 1930s New Orleans. Cared for by them since her parents were killed in a Caribbean hurricane, Addie is chafing at life in the genteel household and desperate to retain her fading memories of her mother. With the help of a new friend, who eagerly embraces the mystery, Addie finds her own puzzling clue in the attic, (proving it’s an old trope but a good one), and starts asking questions. In her case though, the truth is revealed more by listening and noticing—by gauging the reactions of others when her mother’s name comes up. Step-by-step Addie moves from one family member and friend to the next, pressing each for a bit more information until the final picture, the true picture, of her mother is revealed. It is clear early on that Addie’s relatives know all the answers; it just has not occurred to them that she would ever want to know more than the entirely acceptable story they crafted about her parents. Amoss shows that assumptions about “what is best for the child” can often go awry and rarely hold up to the impertinence of a truly determined miniature Nancy Drew. This basic premise of adults exerting fruitless control over a situation makes Secret Lives a more traditionally constructed but no less effective title. By the final pages of these two novels, each of the protagonists learns something about themselves and, more importantly, the people they love. These are predictable endings perhaps, in that the mysteries are solved and relationships affected for the better, but that does nothing to reduce their enjoyment. Collectively, we all love a good mystery and everyone of us has a relative who seems to be hiding something. Secret Lives and Girl in Reverse are proof positive that readers need not look far and wide for drama; all too often it is right beyond their bedroom doors. 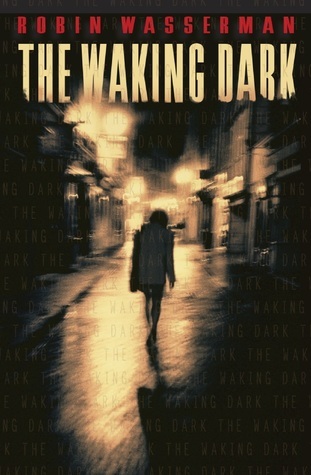 Robin Wasserman's The Waking Dark opens with bloody murder and doesn't slow down for one minute from then. (If you read Black and Wasserman back-to-back, you might want to have a romantic comedy on standby to mellow out to afterward.) It's intense, compelling, and always a coming-of-age story first and a "scary, we might all die, hold on to your hats" suspense novel second. It has been compared in various places to the great works of Stephen King, and I agree that the influence is there, although The Waking Dark ends miles better than It. This is one part Stand by Me, one part Red Dawn (original not remake), and one part every single bad thing you've ever thought about the military industrial complex (see Super 8 for more on this). 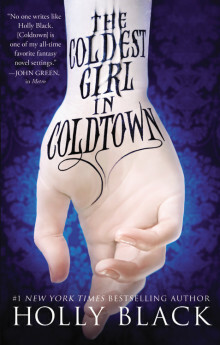 Mostly though it is just a blazingly good story and the sort of page-turner that will keep you up all night for sure. In the opening pages five teens are directly involved in five separate gruesome murders (either as witnesses or participants) in the quiet town of Oleander, Kansas. In the days that follow the shell-shocked population searches for answers to the crimes, all of which were perpetrated by otherwise perfectly decent residents. As time goes by the teens struggle with their experiences while everyone else tries to dismiss the "Killing Day" as an aberration, wrapping themselves up in religion or denial and doing their level best to resume the rhythm of seasonal celebrations that dictated Oleander's calendar for decades. Then one year later a tornado rips through town, as they do in the Midwest, and all of the Oleander's secrets are blown apart. A quarantine follows, borders are erected, soldiers swarm the perimeter and the five protagonists must navigate a strange new world where societal rules seem to be slipping away in a rush for power, bloody vengeance and paranoia. This is Lord of the Flies times a million and it doesn't slow down until the last screaming page. The plot of The Waking Dark certainly keeps readers riveted but where Wasserman truly excels is also King's strong point -- the characters. Daniel, West, Jule, Ellie and Cass are complex, thoughtful and extremely compelling. They introduce questions of God and fate, good and evil, and bravery and cowardice throughout the narrative and refuse to be pigeonholed into easy categories. All of them are strong and all of them are weak; they make choices both admirable and regretful and their long soul searching journeys, which encompass the entire book, are the stuff of epics. A high school hallway lives in The Waking Dark, and everyone you know passes through its pages, meeting challenges that none could have prepared for. Few will survive intact. The most surprising part of The Waking Dark, though, is just how much fun it is to read. This story takes you away, it steals your breath, it shocks and amazes. Oleander is not Derry, Maine, but damn, it sure took me back. As the school year winds down, I took the opportunity to pass the GuysLitWire Teen Survey to one of my regular customers, an avid reader and D&D enthusiast. - These are the first two books in The Kingkiller Chronicle. - These are the first two books in the War of the Spider Queen series, based on Dungeons & Dragons, set in the Forgotten Realms. - and Harry Potter and the Cursed Child. Because it takes me to another world. Subhi was born in an Australian detention centre and knows nothing but fences and guards and hunger. A refugee, Subhi lives with his sister Queenie and their mother, who grows more and more despondent as the days go on. Subhi finds refuge in his friend Eli, who runs a smuggling operation under the guards' noses. He also likes Harvey, the only guard, or "Jacket" as they are called, that treats the people in the detention centre anything close to human. Subhi's only hope is that his father will someday return. One night, his life changes when he's visited from someone on the other side of the fence. Her name is Jimmie and she asks Subhi to read her stories, stories that were written by her mother who has since passed away. Jimmie's father works double shifts, her older brother Jonah is tasked with taking care of her but he's a teenager and isn't ready to be a parent. Labels: Everyone's Got Issues , Survival , War - What Is It Good For? Current events made this book a more timely read for me and even though this novel doesn't delve deeply into the after effects of large scale weapons, there is still enough detail to enable the reader to empathize with the characters and understand the reasoning behind some of the decisions they make. The overall theme of the book is one of despair, hopelessness and feeling powerless in the face of big government apparatus. The main character is a 14 year old called Charlie Law whose mom is sick and badly needs medicine. All goods are in short supply including medicine so after a chance encounter with a shadowy figure Charlie gains access to a never-ending supply of medicine, no questions asked. This seems fortuitous but perhaps this may not be the case. The restrictions are in place because Charlie lives in a place called Little Town which is under siege from nearby Old Country. The Old Country regime is harsh and soldiers from their country patrol the Little Town streets and sometimes harass Little Townites. In order to survive Charlie's parents has painstakingly taught him a series of rules that are essential for him to survive. His world is altered even further when one day he meets a fellow teen from Old Country whose family has had to flee their home. Will Charlie be able to get along with Pav? Will his government be able to overthrow their oppressors? Some read alikes to this work are The Boy at the Top of the Mountain by John Boyne, The Old Country by Mordecai Gerstein and Eye of the Wolf by Daniel Pennac. Conflict in Conaghan's novels echoes many real life conflicts past and present and I can see this book being used in high school classrooms to broach many difficult subjects. Labels: dystopian , War - What Is It Good For? Grace Llewellyn's The Teenage Liberation Handbook is among the very best books for potential homeschoolers (or unschoolers), along with John Taylor Gatto's Dumbing Us Down. Maybe you believe you aren't ready for freedom? Schools play a nasty trick on all of us. They make "learning" so unpleasant and frightening that they scare many people away from countless pleasures: evenings browsing in libraries, taking an edible plants walk at the nature center, maybe even working trigonometry problems for the hard beauty and challenge of it... By calling school "learning," schools make learning sound like an excruciatingly boring way to waste a nice afternoon. That's low. If you have helped with or supervised your children's homework, or stayed in close touch with their teachers, homeschooling need not drain your energy any more than that. Nineteenth-century "educational" methods do not work very well. We do better when we are free to learn what we want, when we want. The Teenage Liberation Handbook rocks. Big thanks to First Second for the review copy of Scott Westerfeld's first graphic novel. The graphic novel was just released last week, but prior to that, it was serialized online at The Spill Zone. If you're a fan of Westerfeld's work (and seriously, if you aren't, it's likely because you haven't read him yet), this will be right up your alley. In short, she might have taken a tour bus. You see, it’s pretty easy to get into the Exclusion Zone these days. But the poetic version stuck with me—a woman on a motorcycle, a camera, an empty and dangerous world. I’ve always been a sucker for tales about exploring broken, abandoned terrain. As a kid I was an “urban explorer,” though we didn’t have that term back then. I spelunked the buildings at my upstate New York college, and I’ve explored abandoned sites in and around NYC since. There’s nothing quite like the silent loneliness of a place that has been abandoned, restricted, and left to ruin. In these spaces, the usual rules don’t apply. It feels as if the laws of physics don’t either. So what if they really were a slice of another world? That’s what Spill Zone is about. The ways that disasters, canny or uncanny, change the spaces that they take place in. And the ways that we survivors become explorers of those ruined spaces, picking them apart with memories, stories, and art. Looking for information about Grand Canyon National Park? The Smithsonian Museums? Perhaps the Great Wall of China, or maybe the Eiffel Tower? Then Atlas Obscura is not the travel guide for you. Looking for information on where to go to partake in local delicacies such as eggs boiled in the urine of young boys? Interested in the distinction between the largest ball of twine collected by one person and the largest ball collected by more than one person? Then you’ve come to exactly the right book. Written by three writers/editors of the Atlas Obscura website (Joshua Foer, Dylan Thuras, and Ella Morton), Atlas Obscura the book is a massive compendium of weird, remote, and always interesting geographical spots and historical remembrances. If you enjoy the website, you will certainly enjoy this “Explorer’s Guide to the World’s Hidden Wonders.” This is not a book for tourists, and this is not a book for the meek. This is a book for the emboldened, for those who want to see the world’s hidden places. Structured as a geographical tour through the continents, Atlas Obscura is filled with examples of natural wonders: caves, lakes, deserts, and the like. But more interesting to me, likely because they are also more unknown to me, are the human-made wonders. Throughout the book's survey of the various continents are examples of what one person can accomplish through sheer will. Castles, pyramids, shrines—all built by individuals on their own over a lifetime. And of course there are also the oddities: the ice cream parlor in Venezuela that serves over 900 flavors, including Ham + Cheese and Sardines and Brandy; devices used to give tobacco smoke enemas in the 18th and 19th centuries; books bound in the skin of their authors; the "body farm" in Tennessee, where scientists study decomposition; an anechoic chamber in Minneapolis, where the absence of sound freaks out visitors; the one-mile square desert near the Arctic Circle ringed by snow-topped mountains. 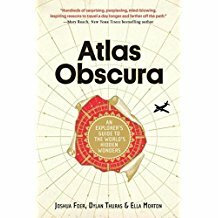 Saturday was Obscura Day 2017 on atlasobscura.com, and this book will make you want to take part in the next one. We often forget the vast weirdness of the world, as well as the isolation that still exists in some places. And though the increasing "stripmallification" of travel pushes people to the same spots, pushes people toward comfort rather than curiosity, Atlas Obscura makes childhood wonder return to jaded adult minds. 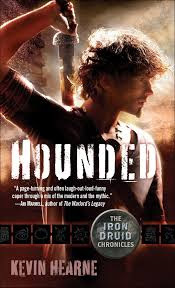 Hounded is the first in the Iron Druid Chronicles by Kevin Hearne. I loved all 9 books and a few novellas as well in this series. Atticus O'Sullivan owns a small shop in Tempe Arizona selling books and herbs to the locals. He looks like a 21 yea-old Arizona State University student, but really he is a 2100 year-old Druid hiding out from his arch enemy Aenghus Og, a member of the Tuatha De Danann or the Celtic God pantheon. Hiding out in Arizona works pretty well mostly because there aren't many Gods from any of the world's pantheon's (all of which exist) around, which is pretty handy. Atticus is magically bound to his trusty Irish wolfhound Oberon so they can speak to each other in their minds. I find this to be particularly entertaining. Oberon is an amazing companion, able to help Atticus when he is in a tight spot or to provide some comic relief in otherwise tense situations. Thanks to Immortali-Tea, Atticus and Oberon enjoy life staying the same age for as long as they wish while fending off attacks from whatever minions Aenghus sends against them. It helps when you get to wield Fragarach, a magical sword that can cut through any armor. I personally think of this series as Percy Jackson for older teens and adults. It has it all, all the Gods from the Celts, the Norse, Hindus, Egyptian, Greek, Roman, Allah, Coyote, Christ and the Virgin Mary to the members of the magical world including the Fae, vampires, werewolves, witches, goblins, sprites, dryads, and the Minotaur. It's all real - though Atticus makes sure to point out that no one thinks Thor is cool like he is in the Marvel movies, not even close! Let's talk about the American Revolution, shall we? At some point in elementary school, every American learns all about Paul Revere and the Sons of Liberty and the Boston Tea Party and the Boston Massacre and the Minutemen and George Washington and Valley Forge and Betsy Ross (who did not exist) and Bunker Hill (which was really a battle fought on Breed's Hill) and the Crossing of the Potomac and, well, I could go on and on and on. Brian Wood wanted to explore the notion of just what being a patriot meant during the revolutionary war period. But he didn't want to go with the big names like Washington and Franklin, he wanted to know what it was for like the men and women on the ground. 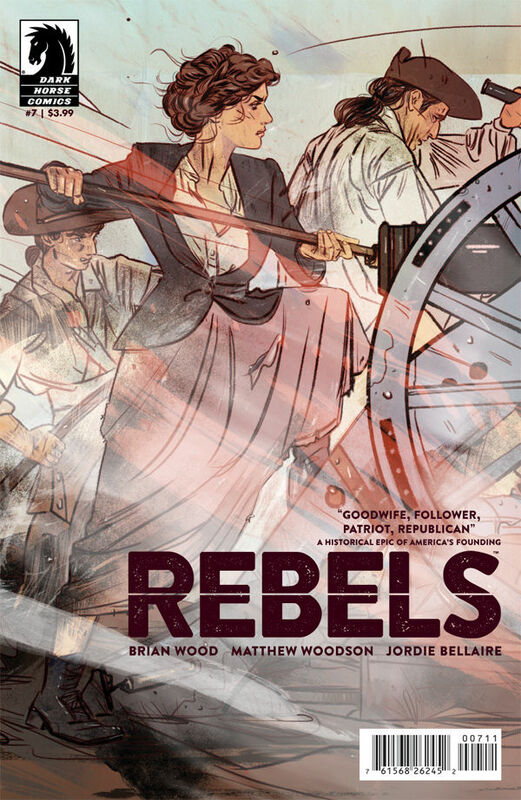 So, Wood created a limited comic book series which is now collected in a trade called Rebels, and it is incredible. Seriously - best thing I've ever read on the American Revolution. In the opening series Wood tells the story of "A Well-Regulated Militia" which focuses on the hard choices of one young farmer who starts out defending his New Hampshire home against the British and then joins the larger effort under Washington. Ethan Allen plays a big part here and the Green Mountain Boys (who you may not have learned about). The story is about how not obvious (or easy) it was for the men who chose to leave their homes. We always think of America as one nation — we might be regionally focused but we are one country. Back in the 1770s that was not the case at all so fighting for another colony was a very big deal. Wood brings that choice to life in the this series in a way that I have not seen elsewhere. There are also stories about Native Americans and how their wars against each other found them fighting on the opposing sides of the French and British during the French & Indian War (the lead-up to the Revolution), there is a story about a fearless young radical in Boston, about a very unfortunate British soldier (conscripted, confused and stuck) and a very (really far too short) piece about a former slave who sides with the British against the Americans in exchange for freedom. My favorite story though is the one that rips apart the Molly Pitcher myth: "Goodwife, Follower, Patriot, Republican". This story about a camp follower, who assists her husband and then, in the heat of battle, takes his place when he falls to keep the cannons firing, seems like a dramatization of the Molly Pitcher legend. But then it takes a dramatic turn when she pursues a pension years after the war. The way this woman — this hero of the revolution — is treated by a bunch of smug men is positively infuriating. It sheds significant light on the work women did in combat even before this nation was a nation however, and is a comic that everyone should read. I love Rebels. This is exactly the kind of writing that we need more of to get people excited about learning American history. All of the art is outstanding: realistic, intense and often very poignant. Rebels shows what comics can do with a subject that seemed to be fresh out of new ideas. Thanks, Brian Wood—this book is outstanding. Labels: Graphic Novel , Historical Fiction , History Matters , War - What Is It Good For?